Jojo managed a pizza restaurant for 10 years and left that to head back to the Fairfax Elementary School as a Para-educator-Behavior Interventionist, working with young students in kindergarten through third grade. This has helped with her coaching immensely, as she has learned that playing along side players boosts their motivation and confidence (especially when they beat her!!!!) Her coaching philosophy begins with fun and engaging, over tedious and repetitive and she will strive to sneak in the learning in the process. Jojo has been playing soccer since she was five years old, coming up from Colchester Recreation League with the boys, onto Colchester High School, winning 2 State Title appearances, as well as club with Far Post. 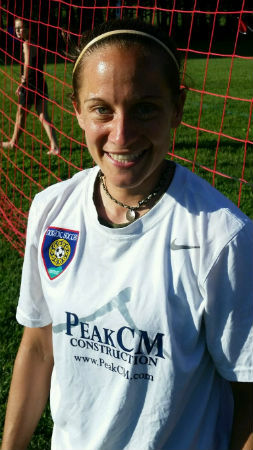 Playing year round with a club team lead her to be strong enough to play UVM Women's Club team for three years and from there has continued to play in a Women's League that she helped to establish. When she is not playing, Jojo is coaching soccer! She is currently the Head Coach for BFA Fairfax Girls Varsity Program, coming off of a very successful 10-1 league record, and getting Coach of the Year for her division. She was hired by Nordic originally through Global Premier Soccer (GPS). Fun fact - When she is not coaching or playing soccer, Jojo is playing guitar (she own's 4!) Her niece and nephews are her world, and yes they already play Nordic!...she also love's Cinnamon Toast Crunch. NFHS coaching principles level II. NFHS Human Kinetics level I strength and conditioning/ coaching principles.